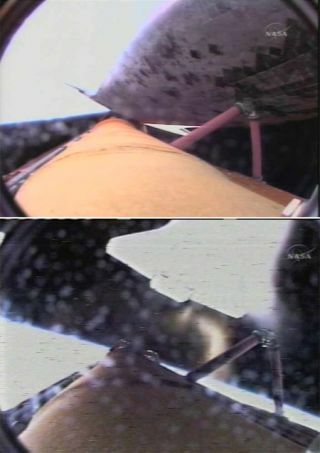 These views taking by a video camera mounted to the external tank of space shuttle Discovery shows the orbiter both attached and pulling free from the 15-story vessel. CAPE CANAVERAL, Fla. - Despite several instances of foam loss during flight, the modified orange external tank that fed the space shuttle Discovery's July 4thclimb into orbit today performed remarkably well, NASA shuttle chief said Tuesday. "I think the tank performed very, very well indeed," said Wayne Hale, NASA's space shuttle manager during an evening press briefing here at the Kennedy Space Center (KSC). "We saw nothing that gives us any kind of concern about the health of the crew of the vehicle." Hale's comments came after a quick first-look at imagery of Discovery's launch, arrival in orbit and the jettison of its external tank after the spacecraft and its seven-astronaut STS-121 crew launched into space on July 4 at 2:37:55 p.m. EDT (1837:55 GMT). During that cursory look at a veritable flood of images, video and radar data, shuttle analysts found seven instances - of which five are related to fuel tank foam debris - of objects falling from Discovery's launch stack. "We put the tank under a microscope this time," Hale said. "It did not perform flawlessly, in that we lost some foam off the tank apparently." Of just the foam instances, all of the incidents occurred well after they could have been a damage concern, the foam pieces in all but one of the events were too small to be a risk to the shuttle, Hale added. A falling shim used to separate shuttle tiles during flight fell at the launch pad. Some foam loss from the aft skirt of one of Discovery's twin solid rocket boosters, which is no worry for the orbiter, Hale said. A small piece of foam debris falling past the left leg of the forward bipod falls aft with no shuttle impact 4 minutes and 50 seconds after launch. Several foam pieces seen falling from Discovery's tank at 2 minutes and 53 seconds after launch. Some are near the orbiter's fuselage, with no damage or contact confirmed. Another small foam event, with several particles with a single larger piece seen aft of the bipod, at 4 minutes and 45 seconds into the flight. A small piece of foam that appears to have bounced off the mid-body of Discovery's belly late in the ascent. At 5 minutes and 48 seconds, several pieces of foam debris seen falling on the port side with no impact to Discovery. "It's all very minor, it's all very light," Hale said. "We don't see any concerns for the orbiter, but of course we will do a 100 percent inspection of the heat shield." Hale said he hopes shuttle engineers will give Discovery's heat shield a clean bill of health by Flight Day 5, or July 9. The biggest modification between the external tank that fueled Discovery's STS-121 launch spaceward today and the orbiter's STS-114 launch last July - the removal of a protective foam ramp that screened a cable tray and pressurization lines from wind stresses during flight - appears to have performed exactly as expected, Hale said. The ramp shed a one-pound piece of foam debris during Discovery's July 2005 launch on STS-114. The debris did not strike the orbiter, but was unacceptably large for NASA's safety standards. A wispy, tumbling white object, which STS-121 mission specialist Michael Fossum reported as a possible fragment from the protective thermal blankets covering Discovery, turned out to be ordinary ice that formed around one of the shuttle's three main engines during launch, Hale said. "It's incredible to me but I've seen it so I know it's true, that the space shuttle's main engines that burn hydrogen and oxygen at 6,000 degrees on the inside, can form frost on the outside," Hale said, adding that a super-chilled liquid hydrogen flowing through cooling lines leads to the ice. "So that is not an issue."